Teenage boys are so closely linked with video games in the popular consciousness that many people assume teen girls don’t play video games at all. As is often the case, the popular image is not an accurate representation of reality. Roughly 84 percent of teen boys game, compared to 59 percent of teen girls. That’s still a huge number of teen girls playing video games, especially when you consider that girls are 20 percent less likely than boys to have access to a gaming console. Why do we talk about video games as if they only affect boys, when so many girls face unfair representations of women and gendered cyberbullying just for trying to join the game? By looking at the facts and encouraging girls and boys to speak up against sexism in the male-dominated gaming world, we can level the digital playing field for our daughters. Perhaps unsurprisingly, there are gender differences in game popularity. Casual players of puzzle and simulation games are more likely to be female. Players of first-person shooters and MMORPGs (massively multiplayer online role-playing games) are more often male. The anomalies are revealing. Multiplayer games like Fortnite that include a balance of male and female avatars and are available in mobile formats are far more popular among female players than other games in this genre. Teen girls may be in the minority, but significant numbers of them are playing the same games as boys. More than a quarter of teen girls play first-person shooters. There are differences in how teenage girls and boys play these games. Gaming is a far more social activity for boys. Only 8 percent of boys play video games without friends. At least a quarter of girl gamers are strictly solitary players. 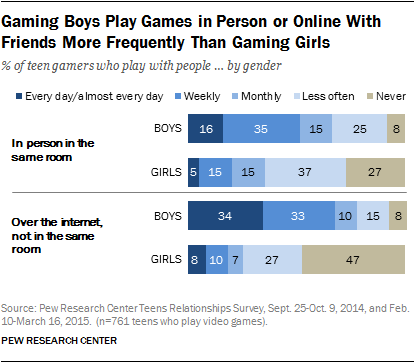 More than half of girl gamers play online games (over 90 percent of boys do). But only a quarter of girls who play online do so with their mics turned on. If you do the math, that’s fewer than 10 percent of all teenage girls who speak in public video game spaces. This online silence reflects the reality that game culture is not quite safe for girls. Cyberbullying is a problem for children of all genders, and kids need to be taught how to avoid becoming either a bully or a victim. But the unfortunate truth is that for girls, cyberbullying is often gendered. Female gamers receive three times more negative comments from other players, and the “trash talk” aimed at them is more likely to reference their gender. It’s no wonder girls play with their mics off. While girls face discrimination in male-dominated games, they can also be exposed to inappropriate content and sexism in games specifically targeted to them. Fashion games can reinforce unhealthy beauty standards with nearly universal slim, white characters. Otome dating sims frequently offer protagonists limited agency and present abusive characters as romantic options. Both boys and girls need to understand that video games that omit female characters or present them as hypersexualized characters are inaccurate and potentially harmful representations of life. Parents of boys should emphasize that it’s as important to call out sexist bullying online as it is in real life. To help teens stay safe gaming, talk to them. Research the games they want to play, check those privacy settings and know how to report and block players who cross the line. Connect Safely provides a guide for video game safety and Common Sense Media addresses common issues faced by teens on its “Cyberbullying, Haters and Trolls” page. There are real risks to online gaming, but there are real benefits, too. Besides being fun, gaming can boost learning, health and social skills. Video games are a major venue for boys’ friendships, but isolation prevents girls from enjoying the same social benefits.